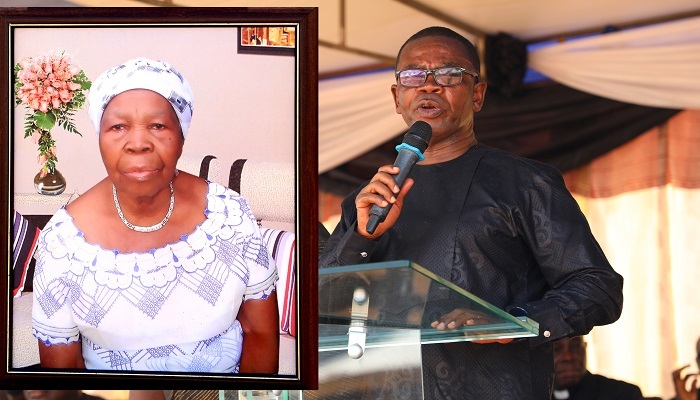 A memorial and burial service was held on Saturday, November 10, 2018, in honour of Mrs. Selina Tiakor, mother of the Children’s Director of The Church of Pentecost, Apostle Fred Tiakor. The service, which was attended by a host of ministers of the Church, was officiated by the General Secretary, Apostle Alexander Nana Yaw Kumi-Larbi. Mrs. Tiakor together with her husband, Pastor Matthew Tiakor (of blessed memory), served in the full-time ministry of The Church of Pentecost for 25 years and retired from active ministry in 1984. Their ministry took them to Akim Wenchi, Peki, Nsawam, Techiman, Effiduase Asante and Tsito. During the funeral service held at the Odorkor Police Park, children and grandchildren of the deceased reflected on some of their fond memories of Mrs. Tiakor in touching tributes. Mrs. Selina Tiakor joined the Kwashieman Official Town Assembly in the Kaneshie Area 32 years ago, after she retired from active ministry with her husband and has since fellowshipped with the Church. The Kwashieman Offical Town District also seized the opportunity to pay their tribute to the departed whom they affectionately called “Osofomaame Tiakor”. “We noticed that Osofomaame Tiakor was faithful in giving tithes. This act of consistency in tithing was exemplary in the Church. Even when she became weak and was unable to come to church, she would ask people to tell her the value of gifts she had received and based on that she paid tithes on the gifts,” the tribute read. A tribute read on behalf of the General Council of The Church of Pentecost by the Rector of Pentecost University College (PUC) and an Executive Council Member of the Church, Apostle Dr. Daniel Walker, described Mrs. Selina Tiakor as someone who was very faithful in her service to God. “Even in retirement, Mama Tiakor’s commitment to the things of God was worthy of emulation as she continued to serve the Lord in earnest, sharing her rich experiences with the younger generation,” the tribute further read. Speaking on the topic: “Where My Lord Is There Will I Also Be” based on John 12:26 and John 14:3, among other scriptural references, the Tema Area Head, Apostle Matthew Larbi Wettey, said that Jesus has given believers an assurance that He would come back for them and take them to be with Him. He, however, stressed that Jesus is not coming for self-professing Christians, but those who have surrendered their lives to Christ and follow Him. Reading from Matthew 28 and Acts 1, he stated that Jesus, indeed died on the cross, but after three days He was raised from dead. The Tema Area Head explained that after His resurrection, Jesus lived on the earth for a while before He was lifted up to heaven. He said that the disciples were witnesses to the fact that Jesus was lifted up to heaven since the incident occurred right before them. Apostle Wettey further stated that whilst leaving the earth Jesus assured them that He was going to His Father and that He will be back for them so that believers would be with Him where He currently is. “The scriptures point to the fact that Jesus Christ is in Heaven. For this reason, as believers, we have the assurance that Jesus will one day come back for us to be with Him in Heaven,” he said. He, therefore, called on Christians to serve the Lord faithfully with the hope that one day they would receive the honour of being with Jesus in heaven. Mrs. Selina Tiakor was born on October 15, 1930, at Opretu-Akuapem to Kwabena Osei Bonsu and Felicia Aba. She has indeed served the Lord in her generation. This is evidenced in the fact that she raised godly children, one of whom is currently the Children’s Director of the Church. Mrs. Tiakor, 88, left behind three children, namely Mr. Victor Tiakor, Apostle Fred Tiakor and Deaconess Janet Gakpetor, 20 grandchildren and a great-grandchild. May her soul rest peacefully.